Denny Hamlin drove the No. 11 FedEx Ground Toyota to a fifth-place finish Sunday at Martinsville Speedway, leading 58 of the 500 laps en route to his fifth top-five finish of the season. With the result, Hamlin remains 11th in the Chase standings with three races remaining. Hamlin started 11th as Sunday’s starting order was decided by owner points when rain canceled qualifying, and was immediately collected in an early-race incident in front of him. With only minimal damage to the car, Hamlin used differing pit strategy and was soon able to work his way back up the field. It quickly paid off and Hamlin claimed the race lead by lap 63. Most teams on pit road used different strategies as the #11 machine shuffled throughout the top-10 as the laps clicked during the caution-filled event. Crew chief Mike Ford worked to free up the car for Hamlin just past the race’s midpoint, and on fresh tires and with improved handling, Hamlin was able to pass Jeff Gordon on lap 320 to reclaim the lead. Making his final pit stop of the day with less than 50 to go, Hamlin was forced to restart on the outside line after a flurry of late-race yellows and was unable to challenge for the win. Hamlin also became the 23rd driver in NASCAR history to win at least one race in all three national series with a victory in Saturday’s NASCAR Camping World Truck Series event. The Series shifts to Texas Motor Speedway for Sunday’s 334-lap event on the 1.5-mile Fort Worth oval. Hamlin is the defending fall race winner at the track, leading 31 laps last November to take the checkered flag. The Virginia native swept both races at the track in 2010, leading 12 laps in the spring en route to victory lane. 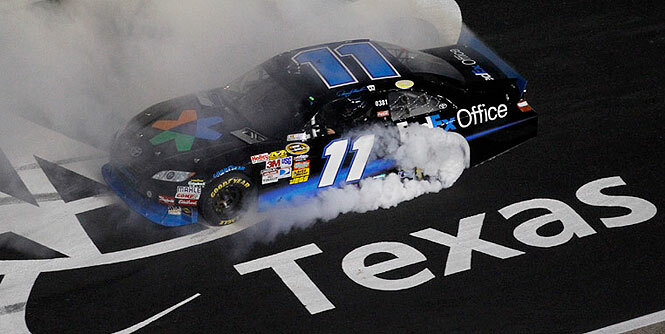 The FedEx team finished 15th at Texas earlier this year. Hamlin fought a loose race car throughout the 334-lap event, lost a lap to the leaders during a long green flag run in the race’s midpoint and never got a timely caution while in position for the “lucky dog.” In 12 starts at the track, Hamlin owns two wins and eight top-10 finishes, and has led 131 laps. Hamlin’s 9.3 average finishing position at Texas is second-best among active drivers, only trailing Matt Kenseth (6.8). Hamlin, FedEx and the American Red Cross will team up to teach school children the importance of disaster preparedness and help build kits to be used in the case of weather-related disasters on Thursday at Cross Timbers Middle School in Grapevine, Texas. The FedEx Office location in Bloomington, Minn., is leading the company’s President’s Club program, and will be recognized with its “0625″ code numbers on the b-post of the #11 FedEx Office Toyota this weekend. How do you focus on the final three races of the season?